We feature incense sticks from Mountain Naturals and Nature Nature, smudges & loose leaf from Sage Spirit & Turquoise Cloud. Most of these scents are native to Mexico, New Mexico, Utah & Arizona. 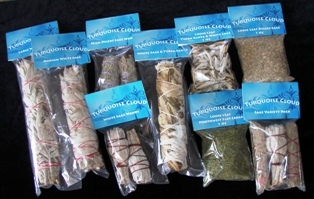 Sage Spirit & Turquoise Cloud Sage Smudges are made from fresh sage in New Mexico, Arizona and Utah. Each ingredient is considered a sacred herb used for centuries by Native Americans in their "smudging" ceremonies. Smudging is the name given to the burning of these herbs for the purposes of cleansing and sending out prayers.